Our choir meets Monday nights at 6:30 p.m. and is for adults 16 and older. The choir leads our 10:30 a.m. Sunday Morning Worship Service and presents special programs throughout the year. There is always room for another voice so join us and make a joyful noise unto the Lord! 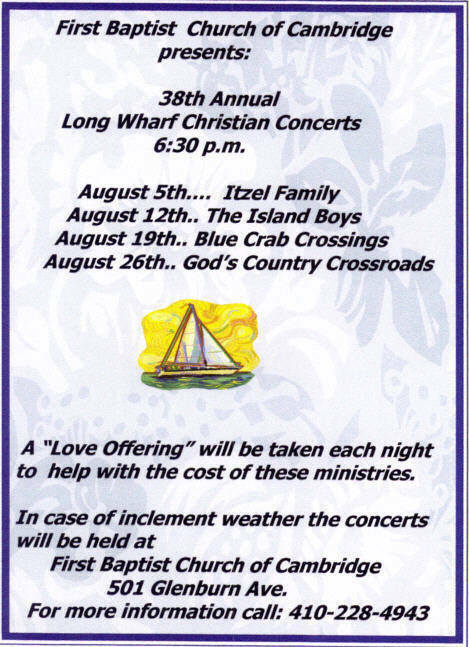 In 2012, First Baptist Church held its 38th annual Long Wharf Christian Concert series at Long Wharf Park on the banks of the Choptank River in Cambridge. Every Sunday evening in August for the past 38 years, First Baptist has presented the great Christian music of soloists and groups and invited the pubic to bring lawn chairs and blankets and sit and enjoy.